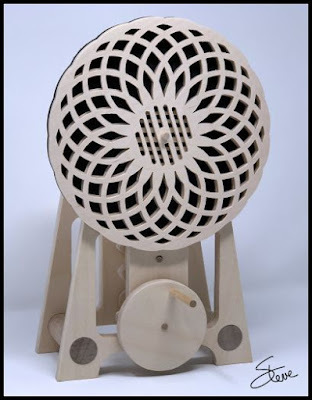 Spiral Kinetic Art Scroll Saw Pattern. This is the animation test I did while designing the pattern. Warning. The pattern has limited assembly instructions. 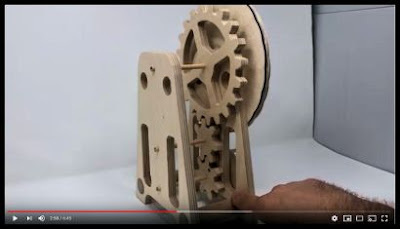 Watch the video below for more details about assembling this piece of Kinetic Art. This interactive kinetic art has a hypnotic visual effect when slowly turned. It works okay with the hand crank but I plan to eventually remove the crank and install a low-speed DC motor for a constant drive. I purchased this 3rpm 12v motor from Amazon for under $8. I think the speed will be just right and I can run it from a 9v battery or a 12v DC power supply. The project is made from 1/2", 1/4" and 1/8" Baltic birch plywood. I also used 1/4" dowels and 1" dowels. 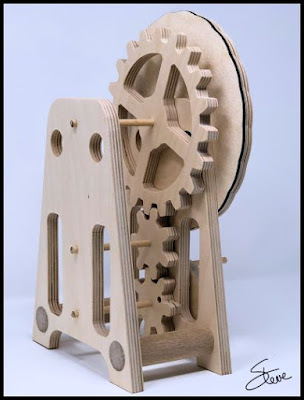 The gears that drive the project are intentionally overkill. They add to the overall look of the art. If you are interested in making this project I highly recommend you watch this video. It will clear up some steps that might not be clear with the pattern alone. 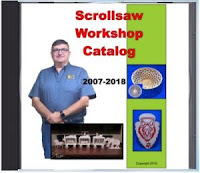 I have received several emails lately asking about the knobs I have on the thumb screws of my scroll saws. People see them in my videos and want to know where they can buy them. 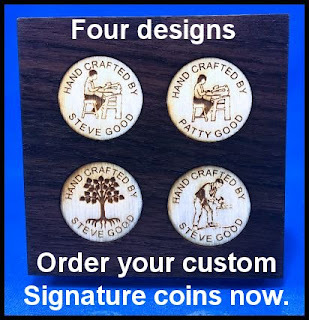 A friend of mine down in Atlanta, (Marcus Bailey) makes these Comfort Knobs. They are aluminum gnarled knobs that fit the S style of thumb screws that come with the DeWalt DW 788 scroll saw. If you look at the picture above you will see that they fit over the existing thumb screw. Notice the S Style slot. You can also use the Comfort knobs on the Excalibur class of scroll saws but you will need to buy the S style of thumb screw also. Item 47 at that link. They are much more comfortable than the stock thumb screw. Many folks with arthritis or other hand problems find them invaluable. One word of caution. Do not use this knob to add more torque to the blade. If the blade is slipping you have other problems. If you over tighten the blade with this knob or any other device you will bend the blade chuck. At that point, you will need to replace the chucks. They run around $15. Item 36 at that link. There are two sizes of knobs. Read the description on the contact card so you know what you are buying. 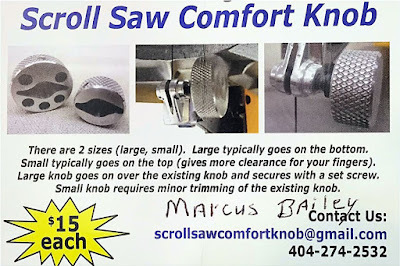 If you have any questions give Marcus a call and he can get you what you need. 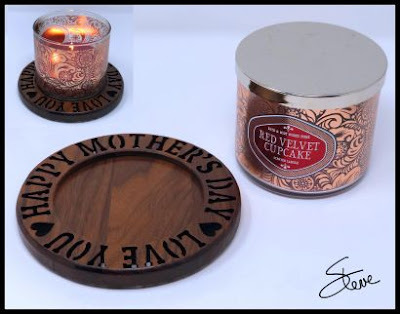 Happy Mother's Day Candle Dish Scroll Saw Pattern. If you know a mother who loves candles then add this Happy Mother's Day candle dish for a nice personal touch. I kept the pattern basic. There is not much ornamentation because the candle is the star. The dish will hold up to a four-inch candle. 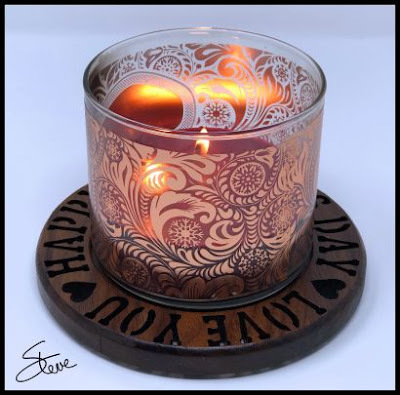 The pattern requires a relief cut for the center circle. A relief cut is simply a cut with the blade tilted to a small angle. 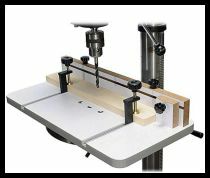 You want to practice the relief cut in a scrap of the same wood used for the project and with the same blade. I used 1/2" thick wood and a #5 blade. My angle ended up ~ 4 degrees. Practice until you get about a 1/4" deep relief. Click to visit the List. 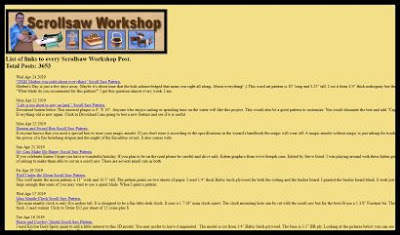 Since May of 2007, I have posted over 3,650 times on the blog. By the way, that is an average of a new post every 1.2 days for 12 years. All of those posts are still available but it can take days to navigate through all the blog pages. One feature that may come in handy is a web page I maintain that is simply a list of all the posts. The list shows the date, title of the post and some text from the post. The title of the post is a link to the blog that will show the complete post. You can also visit the blog and use the search box in the left column to search the entire blog but sometimes this list is easier when you don't have a specific search term. Remember that if you are reading the blog in the email newsletter that is is just a copy of the daily blog post. If you ever lose the email you can simply visit the blog to find out what you missed. 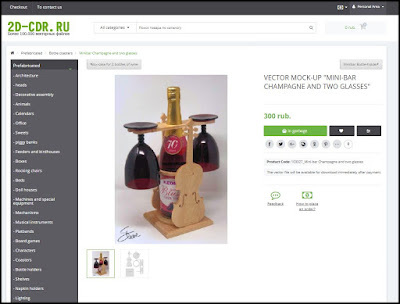 Be careful out there: Bad web sites selling patterns. Do not visit this site. It could contain malware. It is full of stolen patterns. This is a problem I see almost every month now. The problem is growing. One of my readers will send me a link to a web page that is illegally selling my free patterns. Nine times out of ten times the owner of the page will not answer my request to take down the patterns. They are always outside of the U.S. so there is very little that can be done. Most of these sites will have thousands of stolen patterns from many different designers. The reason that the problem has gotten so much worse is the proliferation of inexpensive laser cutter and CNC machines. The number of people looking for patterns has grown so it is worth their time to collect stolen patterns and sell them. You can often tell the site is crooked just by looking at the way the patterns are presented. 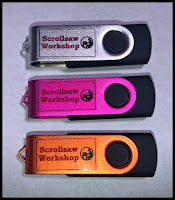 They will be in many different formats. You will see patterns that are obviously designed for different cutting methods. As in the example above they even stole my picture of the project with my signature on it so it is obvious they did not make the patterns. There are many of my patterns on this site. The harm to me is minimal because my business model is to give the patterns for free and make my money from donation and advertising. The harm to many of our designers is much more serious. They make their living selling patterns. The harm to you as a potential customer can be far higher. The likelihood that your identity will be stolen is not worth the risk of dealing with these sites. Many of them contain malware. Most of the time these sites are discovered through searches on Google or places like Pinterest. Just be careful when you are searching for patterns. I don't use the GRR-RIPPER for every cut on my table saw but I do use it whenever my hands are going to get too close to the blade. I consider this jig the number one safety device in my shop. It only takes seconds to set it up for a cut. Those few seconds just may save you from a serious cut.